On 2006's Ringleader of the Tormenters (Morrissey's second since his triumphany comeback two years ago), Morrissey visits familiar ground. 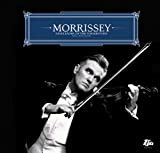 Although it's comforting to hear classic Morrissey, this record lacks some of the momentum that made 2004's You Are the Quarry so great. This record does have some great tracks ("Life is a Pigsty" and "The Youngest Is the Most Loved"), but it fails to grab the listeners attention like You Are the Quarry.